The electronic signature of PharmSchul offers the possibility to sign electronically for the participation in reading training as well as for the participation in classroom training. As soon as a participant signed electronically for his participation, the participant will be automatically set as taken part in PharmSchul and the training demand is fulfilled. Therefore it is no longer necessary that SOP documents circulate in the company for months until each participant has read the SOP and signed manually for the reading. By using the Electronic Signature the participation will be IMMEDIATELY displayed in PharmSchul and the participation will be considered in reports. It is no longer necessary to print out the list of participants. That means less paper is needed. That's good for the environment. Nevertheless it is still possible to create a list of electronic signatures for each training at the touch of a button. 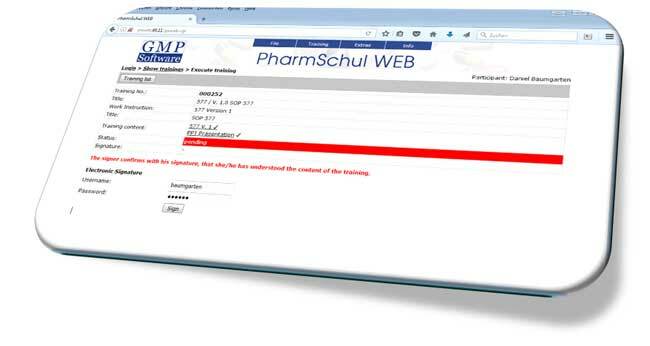 PharmSchul is using the advanced electronic signature within the meaning of the German Electronic Signature Act SigG § 2. The electronic participations will be documented in the Audit-Trail. Of course the function electronic signature is validated.